May Our Almighty Father greatly reward you for your kindness to our mission. Gradually, we are working our way across our recent financial bump in the road, and we thank you from the very bottoms of our hearts. By your generous gifts and your prayers, you keep this beacon alive and strong, a beacon upon which thousands of families depend each day — for inspiration, information, positive companionship and worship, for weather broadcasts by which they make life-or-death decisions. We ask that you please continue your help. If you are unable to give, perhaps you can interest another person in doing so. Either way, please continue to pray for our work and we will continue to pray for you and all of your intentions. 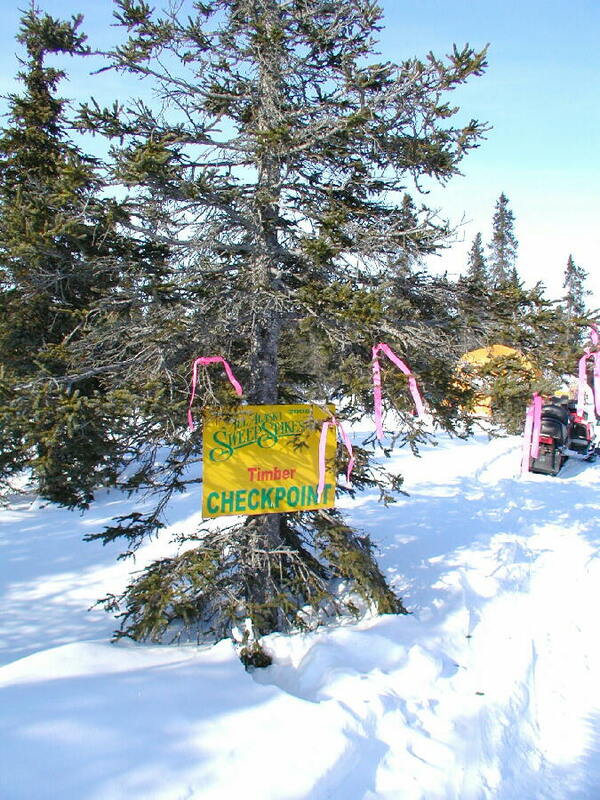 Thank you so much for your great thoughtfulness to the remote people whom we serve. God bless you! WHEN “LES” IS MORE: Former chief engineer Les Brown now lives in Palmer, Alaska, and we are grateful for his two-week visit, making sure everything at the mission is ship-shape. Les repaired broken headphones and many other small dings, and performed the station’s mandated Quarterly Tower Light Inspection. Please join us in prayer of thanksgiving for his lending a helping hand. 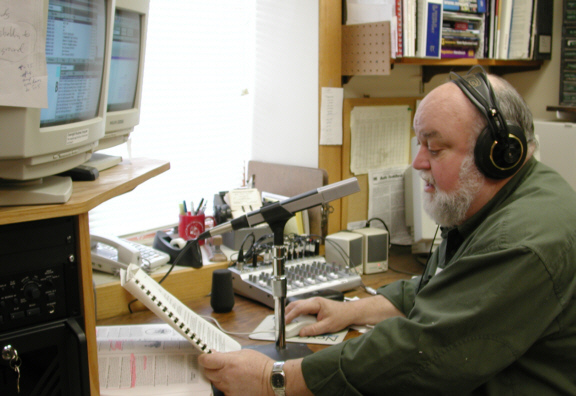 Left: In 2003, one of Les' chores was recording vocal tracks for KNOM's automated overnight programming. Blizzards delayed Les’ departure for two days; that same week, another blizzard pinned down Tom Busch for the better part of a day. May began with plenty of snow. Hello...you've already joined us at www.knom.org. We welcome you. 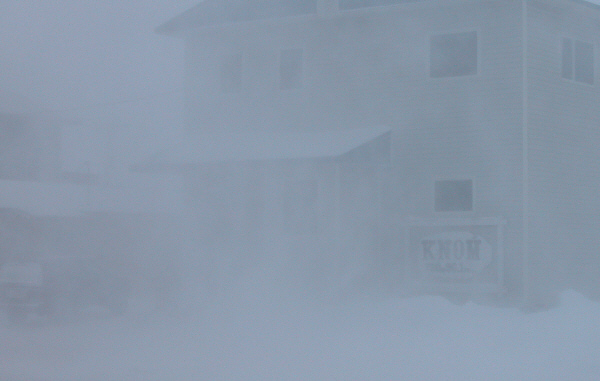 You can browse through the 143 most recent Nome Statics, check Nome’s weather, or contribute a memorial to a friend or loved one. Thank you for visiting. INSPIRATIONAL SPOT: For mothers, feeding our children is automatic. Even when our children are grown and living on their own, we still find great pleasure in feeding them when they visit. There’s always something to eat at Mom’s house. God’s the same. He showered the Israelites with manna from heaven. He turned a few loaves and a couple of fish into a feast for five thousand. Every time we celebrate the Eucharist, God invites us to eat, because there’s plenty for everyone. 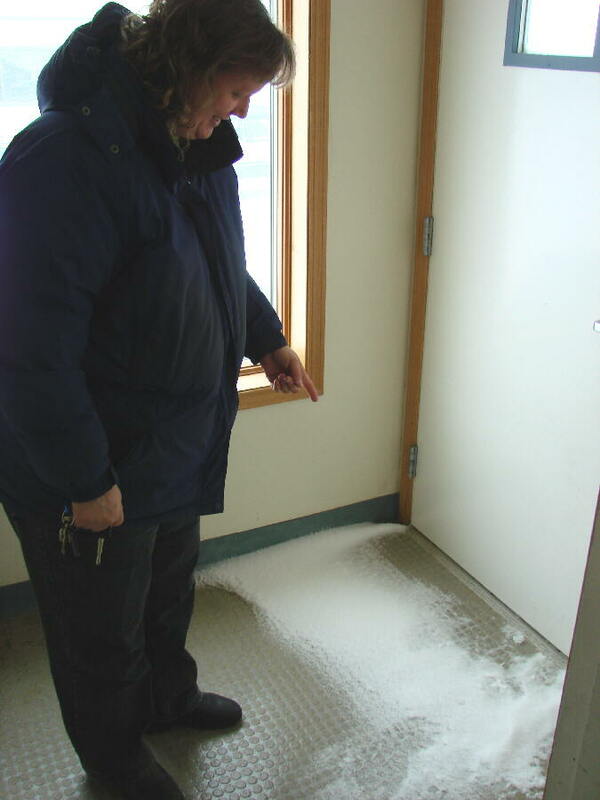 WE GET THE DRIFT: (left) As KNOM business director Lynette Schmidt points out, the wind in Nome is so fierce that it forces snow right through the weather seal on the front door. On the open tundra, you’ll see it so brutal that it pushes snow through zippers! Lynette is in the studio building's “arctic entry.” Common to buildings in this region, it is an unheated porch that helps prevent warmth from escaping. MAILING WOES: We only learned in mid-March that the lettershop which produces this newsletter had failed to mail January’s, February’s and March’s. It also came as news to the manager and owner of the shop, who are unable to explain the lapse, but have pledged to take whatever measures they can to make things right. Among those measures was to mail the January and February editions First Class Mail, at their expense. Thank you to our many contributors who alerted us that they missed the Static, leading us to discover the problem. If you’ve been following our work for a while, you’ve seen that this has been a difficult financial year for the mission. Fortunately, thanks to support from you and others in the KNOM family, we were able to remain constant to our listeners, providing them with our reliable, award-winning level of attention and service, 24 hours a day. Thank you again for helping to make it possible. IT MAY…This month, it’s possible that Nome’s Bering Sea ocean ice will break up, though it’s more likely to happen in June. About mid-month, night-time temperatures will remain above freezing. An old-timer, however, reminds us that Nome’s 1947 Memorial Day parade was canceled due to 4-foot snow drifts! Please consider adding KNOM to your will, a legacy that will touch many lives. INSPIRATIONAL SPOT: We are given many chances and opportunities to live out God’s commandments. But there will be a point in our life when we make a choice, either to be with God or to be against God. Jesus warns his would-be followers not to be complacent, not to be slow to reform their lives. Rather, we need to proclaim boldly what we believe through our actions and words. INSPIRATIONAL SPOT: Do you grow frustrated when you have to wait for something or someone? Try praying for people who are waiting in extreme conditions of hardship. Pray for people in hospitals struggling for recovery or fighting illness. The next time you’re waiting. . . why not pray for those who truly wait? TEAM MICHELANGELO: (left) At first, you might have been a bit concerned. 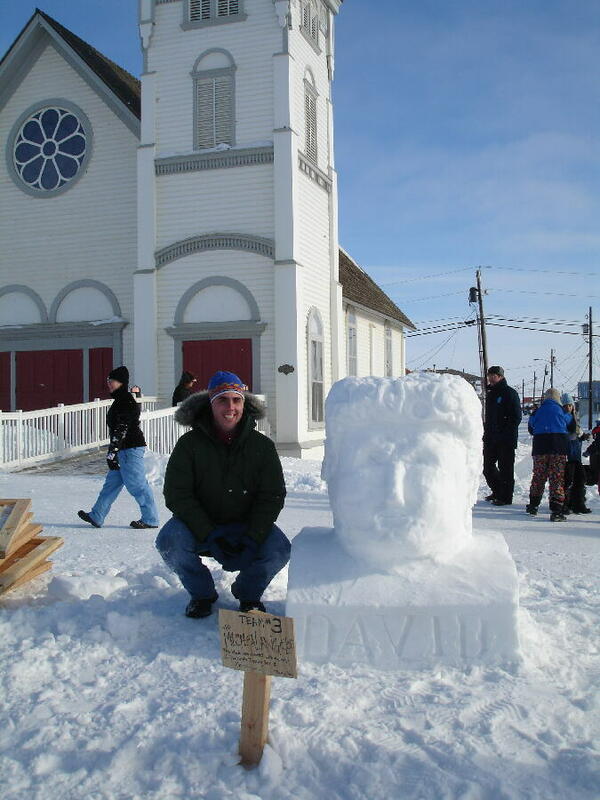 KNOM’s David Dodman was volunteering to help three teenagers sculpt a snow replica of Michelangelo’s “David” in front of Old Saint Joe’s Church. When he’s not helping teens with snow sculpturing, David is in his second year as the mission’s volunteer inspiration director. VISITING: This spring, we welcomed a visit by program director Kelly Brabec’s mother and stepfather, Algene and Dan Brabec, in town from Fremont, Nebraska. An ordained deacon, Dan officiated at Eucharistic services for a thankful congregation two weekends at Nome’s St. Joseph Parish. THE MASS: KNOM’s primary focus includes some forty villages scattered throughout 100,000 square miles. We also have listeners up to a thousand miles inside Russia, and in the darkness of winter, we have daily listeners in many more places, across Alaska and into Canada. As far as we know, our farthest regular North American listeners are in the Aleutian Islands to the southwest , and (during winter) in Herschel, Yukon Territory to the northeast, both about 800 miles distant. This vast, roadless, extremely rural area is served by only about 15 priests. Villages with Catholic churches, chiefly along the west Alaska coast and the Yukon and Kuskokwim Rivers, may be lucky to see a priest once a month. Villages without a Catholic church, the majority, see a priest never. If you are Catholic anywhere in our coverage area, your best, or often your only, chance to worship with the Mass is by listening to it and praying along with it, thanks to your radio and the KNOM signal. We are deeply grateful for your helping us provide this crucial service. 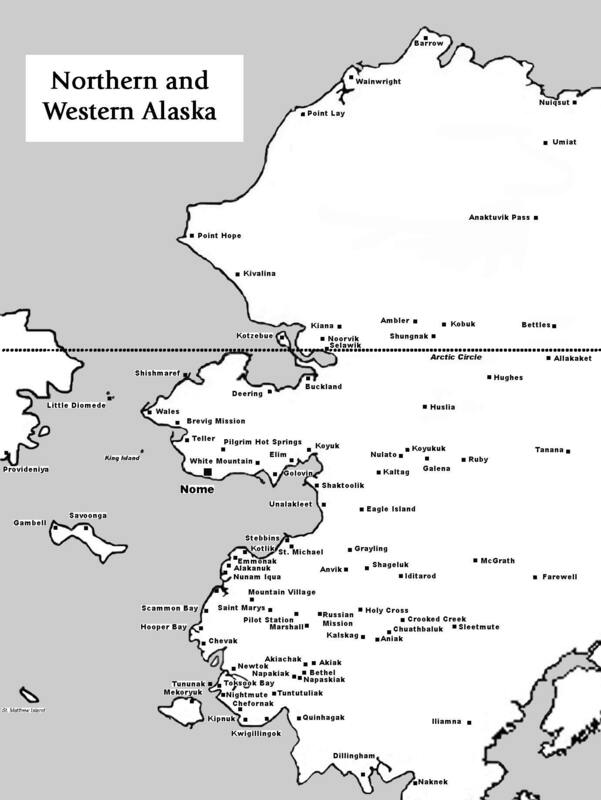 (Left) Many of the remote points mentioned above, such as the Aleutian Islands and places inside Canada and Russia are far off this map. The most distant point from which we regularly receive telephone calls during discussion programs is Iliamna, Alaska, a burg with 82 souls that lies 483 miles southeast of Nome. You'll see it at the lower right of this map. INSPIRATIONAL SPOT: The vitamins you buy in the store list the percentage of minimum daily requirements of essential nutrients in each pill. Unlike vitamins, God offers much more than our minimum daily requirement of love. And, you cannot overdose. God’s daily love makes you holy and healthy. SUITED UP: (left) KNOM news director Paul Korchin, at left, and public affairs directory Amy Flaherty, are fully insulated to cover the 100th anniversary running of the All Alaska Sweepstakes, a 408-mile sled dog race through the wilderness. 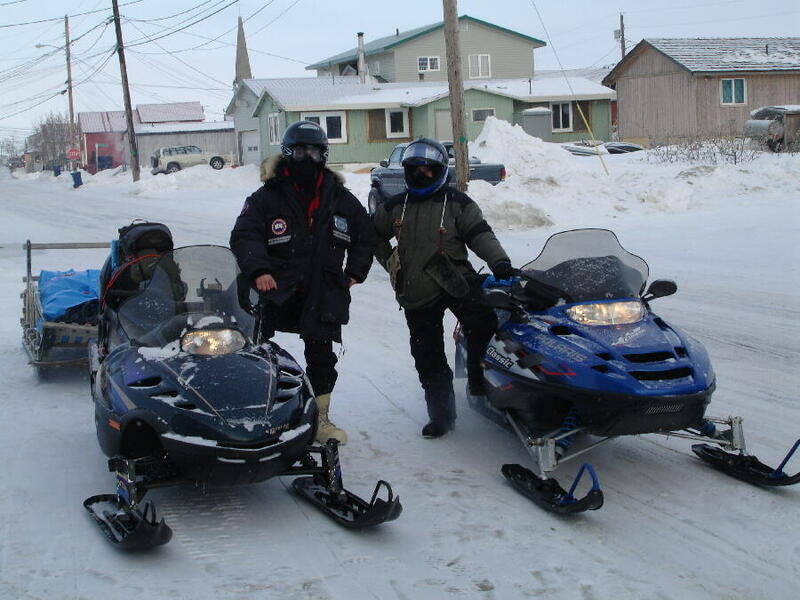 Use of the snowmobiles and sled were donated by kind local supporters, and the pair reported on the race using a satellite telephone that was lent to the mission by Nome police chief Paul Burke. KNOM already enjoys a majority of local listeners, and for the Sweepstakes, radios were kept on extra-long. 30 YEARS AGO: In May 1978, KNOM volunteer secretary Joanne Ambrosi is startled to hear 5-year-old Karlin Itchoak (son of Noralee Itchoak, KNOM’s first volunteer) proclaim that he is going to carve an ivory bear. She cracks up when she learns it will be made of Ivory Soap. The old studio had been a poorly insulated house, and volunteer residences were “temporary” World War II “knockdown” buildings that, literally, were falling apart — and dangerous. Comparing KNOM’s electric, fuel, staff and maintenance bills with those prior to this efficient building and its corresponding volunteer dormitory, adding in all factors, they are saving the mission up to $200,000 a year. If you were among the contributors who made them possible, please pat yourself on the back! If you are new to the mission since then, please be assured that due to improvements like these, your gifts are spent as carefully and efficiently as possible. (Left) KNOM's Keller Broadcast Center is named for the Keller Foundation. Here, on Christmas Day 2004, the building's 15-inch thick walls show their mettle. THANK YOU ONCE AGAIN. Until next time, may God richly bless you and those you love.